Steve Wolf (BBA ‘11) is an account executive at SmartAsset, a personal finance platform that helps users find simple, transparent answers to their most important financial questions. Alma Matters recently sat down with Steve to catch up. A: I’ve been living in New York City for almost five years now. After graduating, I accepted a job offer at Everyday Health Inc., a digital media company, and spent the first four years of my career there. My first role was in project management, helping to produce custom advertising solutions for pharmaceutical companies across a portfolio of websites. Two years later, I moved into an ad sales role where I worked directly with brand managers and their media agencies to sell through those same custom sponsorships I used to produce. 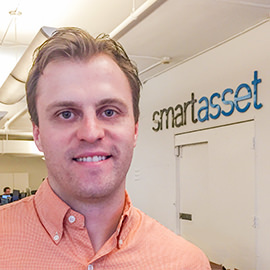 I now work for financial technology startup SmartAsset, where my focus is monetizing its online content and tools. We’re currently working on closing our series B round of financing. A: Winning the Integrated Case Exercise (ICE Week) in third year is up there, especially because that happened with close friends on my team. Being part of the first delegation to represent Laurier at JDC West and then starting our winning tradition at JDC Central the next two years was also an incredible experience with unbelievable people. Honestly, looking back at every important moment or achievement I can think of, the people involved in those moments made them special. Even simple things like studying late in the PRISM lab, I remember those nights because of the people around me. You meet some truly remarkable people in this program. A: It teaches you about yourself – how you learn, process new information and what your learning curve looks like. You discover the importance of prioritization and completing the big tasks first, especially in team situations. You also find out how your style meshes with the others around you and the importance of strong working relationships. After graduation, so much of your success comes down to your ability to execute on the details and outdo your competition – a BBA gives you an idea of what it takes. While it can be challenging to imagine the real world application of some courses during school, I've found the majority have turned out to be extremely useful in supporting my thoughts and opinions with business rationale. A: Probably injuring myself in a men’s league basketball game, effectively ending my (storied) recreational athletic career. But in all seriousness, professionally, I’m really proud of the work we’re doing at SmartAsset. Free, accurate and unbiased financial advice is really hard to find online, and the team I work with is so smart and inspiring to be around. I do think I’ll stay in fintech for the foreseeable future, so right now I’m just grateful to be working in a field I love and I’m trying to figure out what it takes to be “great” at what I do every day.